First of all congrats, for getting a worthy MP elected for TVM. After seeing the polling percentage, it was a bit worrying, but the people have shown that if you give a worthy candidate people will vote irrespective of all the differences. great result. Now coming to the Bus rapid transport system, i am not very convinced as i have lived in Pune and Delhi where the same had been implemented. The project had so many problems.So many accidents and deaths were caused as traffic and pedestrians could not be properly segregated. 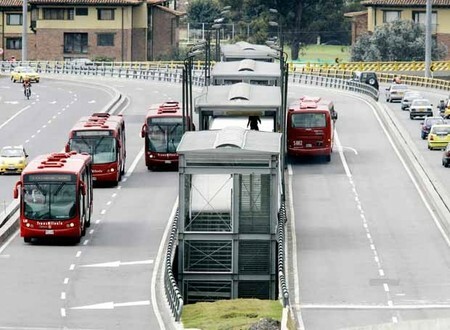 In so many places existing lanes of already congested roads were assigned for BRT which resulted in even more congestion.If its a greenfield project(elevated would be ideal, but costly) its great, but when we implement it on our existing roads as a brownfield project, the restrictions imposed will kill of the project or even give the opposite results. Lessons need to be learned from similar projects in India. In Delhi the whole project was technically designed by IIT Delhi, and was said to be based on the system in Bogota Columbia, one of the most successful ones(shown in your pic). But I am sure the implemented project differed from what was envisaged on paper. Great deal of study need to be done in Traffic flow analysis/future traffic volumes, routing etc. and the project has to stick to the design, otherwise we will end up with a monstrosity of a project of no use to the public. I am not trying to be negative, but whoever is coming up with this project need to learn from the mistakes done in other cities in India and not base the project on overseas implementations. The way people drive in India is different( no lane discipline, no respect for basic traffic rules and so on and on), so the BRT also need to "indian traffic proof"(for lack of a better word). If everything is taken care we are sure going to get a great system.